Researchers at MIT today revealed their fishiest project yet: a swimming robot. SoFi is an autonomous underwater vehicle that looks like a fish, swims like a fish, and even has a fisheye lens for its built-in camera. It’s here to uncover the ocean’s mysteries by pretending to be just another Nemo or Dory in the sea. The Computer Science and Artificial Intelligence Laboratory (CSAIL) at MIT designed the robot to look and move like a real fish, complete with an undulating tail to provide propulsion and a unique buoyancy method which allows the vehicle to ascend and descend. SoFi was field tested in the Rainbow Reef off the coast of Fiji where it swam with real fish at depths of over 15 meters (50 feet). Its realistic movements and soft body design allow for greater control, giving scientists a new perspective on marine wildlife. The authors show a number of technical achievements in fabrication, powering and water resistance that allow the robot to move underwater without a tether. 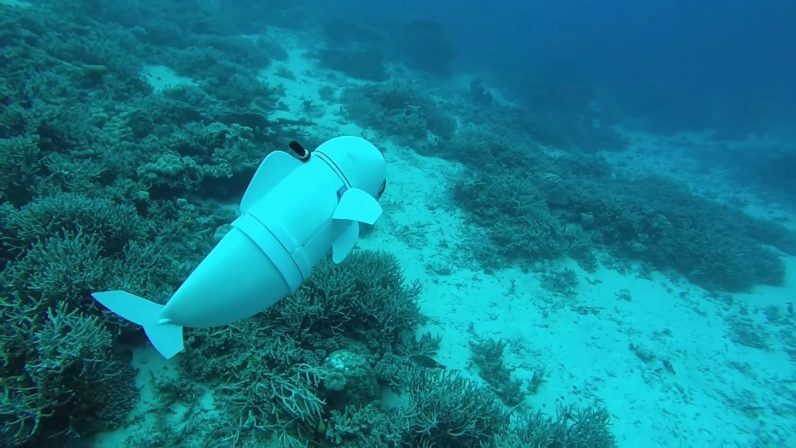 A robot like this can help explore the reef more closely than current robots, both because it can get closer more safely for the reef and because it can be better accepted by the marine species. Creating the most advanced robotic fish in the world requires cutting-edge technology and never-before-seen designs. But when deciding on control method the researchers decided to go old school: the team used a waterproofed Super Nintendo controller. The future looks bright for the SoFi project. It could change our understanding of ocean animals like the mysterious Chimaera (Ghost Shark), but it could also provide new insights into ongoing global problems like the deterioration of the Great Barrier Reef. Getting cameras into areas too dense or dangerous for people to enter often means sending delicate equipment into places where collisions are both likely and damaging. SoFi, by contrast, moves like a fish and remains impact resilient thanks to its soft design. It should be able to go deeper, get closer, and come back with more information than any system before it. CSAIL’s other recent advances in robotics have dealt with everything from carpentry to shape-shifting, but SoFi may be its most exciting contribution yet. After all, our planet is mostly ocean. It’s in our best interests to unravel the mysteries of the deep.